Whilst it’s easy to think about adopting a siege mentality when considering the challenges we might face as human beings, building communities and sharing might, in fact, be a more sustainable option. Often, when people discover permaculture, they feel that the answer to reducing their ecological impact is to find some land, shut themselves away and become self-sufficient. Quite often, as time goes on they realise that this isn’t a viable way forward… what if they get sick? what will happen when they are too old to support themselves? is it possible to be self-sufficient in all respects… heat? clothes? health care? And frequently the conclusion is that we cannot completely isolate ourselves, and some goods and services need to be sourced externally. 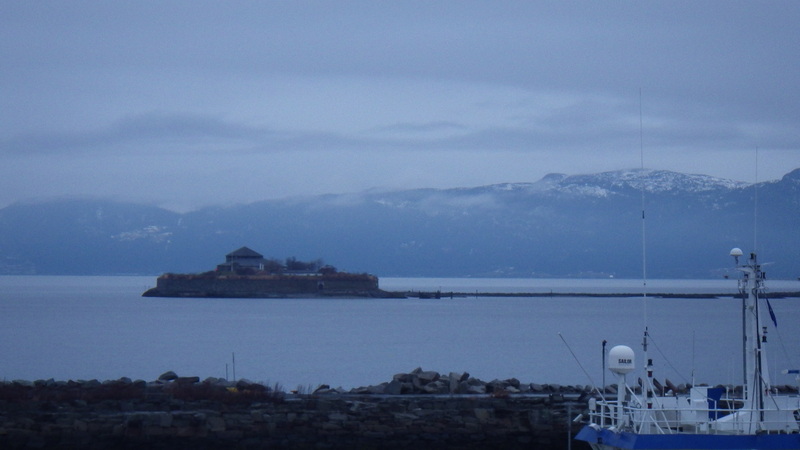 No one is an island! Indeed, human beings are inherently sociable – we have lived in communities throughout history. Perhaps today, though, the spaces that we find ourselves in are generally too full and we are overwhelmed by numbers, leading us once more to adopt that siege mentality: to close our front doors and isolate ourselves from our neighbours, obtaining all our goods and services from corporations, with which we have no chance to develop any relationship other than a financial one. Here in the UK at the moment, many people are struggling though the snow (not here on the coast of west Wales, but we seem to be the exception). It’s at times like these that you might wish to be part of a community – whether it be to help with shovelling snow, jump-starting the car, sharing food or simply knowing you have friend close at hand. Now is a good time to start building those links if they don’t already exist – what could be more welcome than a call from a neighbour to check that you are ok and don’t need any help? And once you’ve made that connection in a time of adversity, it’s likely to carry through into the good times. Offering help now is likely to pay off later… even if only in the form of a cheery hello in the future. The links that we make with other people can lead to unexpected benefits. Whilst we were on holiday, our hens could not be cared for as usual by our neighbours (they were away too and their absence was prolonged because of a funeral), so our girls went to stay with some friends about 25 miles away. These friends also have hens, but theirs are rescued ex-battery chickens that are somewhat less robust than our locally bred outdoor lot. As a result, they had mostly stopped laying over the winter. Our girls (apart from Lorna who rarely bothers) were still producing, so were able to pay their rent whilst visiting! And, strangely, when ours returned home, the ex-batts started laying too… perhaps there was some sort of pheromone thing going on. Clearly a mutually beneficial relationship, but it didn’t end there. 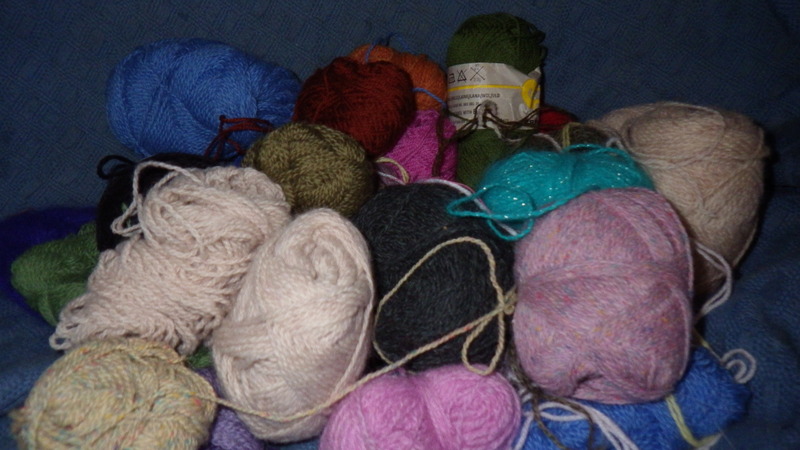 When I went to collect our hens, I was presented with a bag of knitting wool goodies – lots of balls of fine gauge wool that my friend had got in a big bag of mixed gauges from Freecycle. She wanted the thicker wool in the batch, but had no use for the fine stuff. I would never have thought to look on Freecycle for wool and would have missed out on this lovely resource to use for my Beekeeper’s Quilt project. Because she knew I would use the fine wool, my friend was able to accept the whole offering and know that none of it would go to waste. Everyone was happy, and there is more ‘stuff’ that has been prevented from going to landfill. So, building relationships enriches my life, both emotionally and materially. My community of friends is not, however, exclusively built of people who live close to me. I use technology to keep in touch with people around the globe and even those a long way away can enrich my life, and people who I only see rarely are still important to me. Whilst teaching I meet people from all over the place… and it is one group of such people who have been on my mind recently. 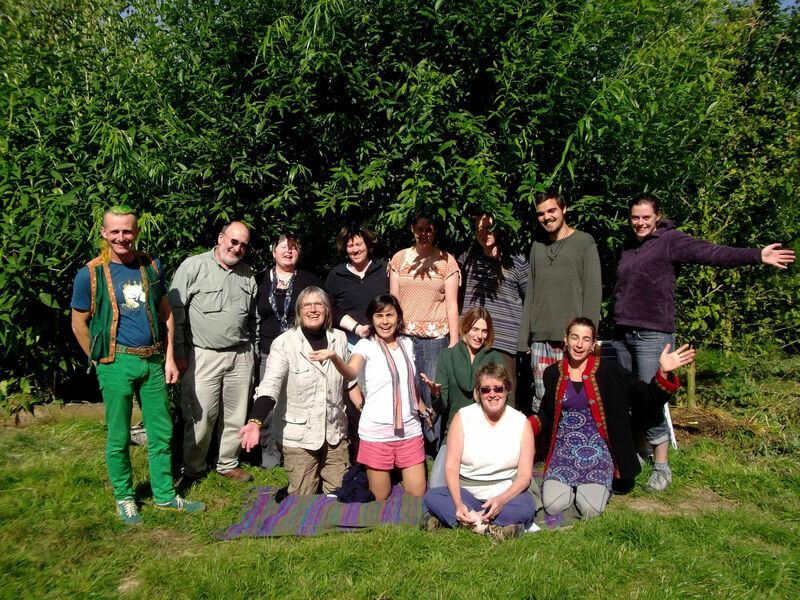 These are the lovely Wheelhouse family at Karuna… a fabulous forest garden project in Shropshire who hosted a course that I taught last summer. They currently need help – they have finally gained permission to build a straw-bale roundhouse to function as living space and office. Sadly, their fundraising campaign has gone slowly… and with only a few more days to go, they are some way off their target. This project is close to my heart, first because it deserves to succeed so that Karuna can continue to flourish, but also because there is a significant ‘people care aspect’. You see, Merav Wheelhouse has Huntington’s disease – an inherited condition leading to progressive deterioration of the nerve cells in the brain. There is no cure and no way of slowing the symptoms, which include problems with feeding, movement, behaviour and communication. In the past, the Wheelhouses have been understandably reticent to highlight this issue, but Janta has mentioned it in his latest blog, and so I feel able to write about it a little. Although I only met Janta and Merav last year for a few days, their situation has moved me greatly. And so, I mention them as part of my network of friends, but also as good people who are treading very lightly on the earth and deserve wider support. If you would also like to support them, you can donate here and if you do, you have my sincere thanks, a warm glow and the knowledge that what goes around comes around! Loved this post! Thanks, Jan. Thank you… I have been really bad at writing recently, but I’m hoping to get back into a routine now! What a lovely post about the importance of community. So true that we will be collectively much happier if we learn to build connections with others, and everyone’s lives will be enriched. I love the blogging community too… so much support and positivity!